Co-created by Ford Performance and Gittin's RTR Vehicles, the camouflaged, fighter aircraft-inspired Mustang GT fastback debuts at Goodwood, before heading back to the US. 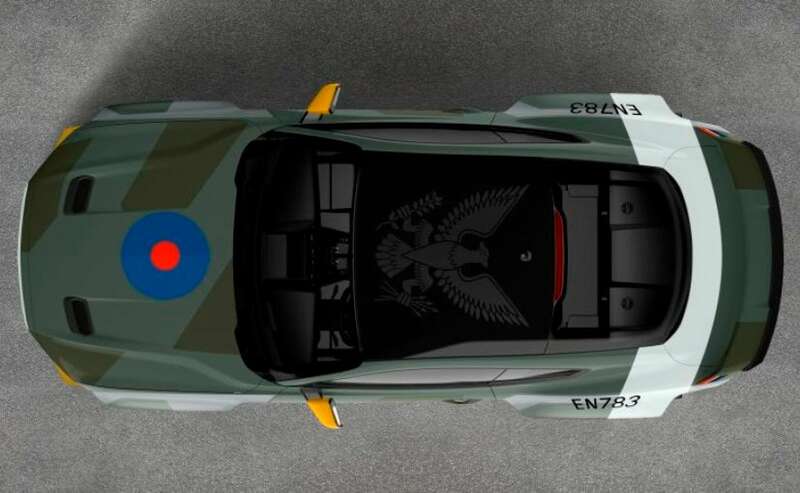 Ford and world champion drifter Vaughn Gittin Jr. are paying tribute to American fighter pilots who served in the Royal Air Force during World War II, inviting Gittin to pilot the one-off Eagle Squadron Mustang GT at this year's Goodwood Festival of Speed in the UK on July 12, 2018. Co-created by Ford Performance and Gittin's RTR Vehicles, the camouflaged, fighter aircraft-inspired Mustang GT fastback debuts at Goodwood before heading back to the U.S. for the Experimental Aircraft Association's AirVenture Gathering of Eagles in Oshkosh, Wisconsin, which draws more than 1,000 aviation enthusiasts annually. The Eagle Squadron Mustang GT will be auctioned off to support the EAA Young Eagles charity on July 26, 2018. Darrell Behmer, Ford Mustang design chief, said, "Supporting young pilots through the EAA Young Eagles charity auction reflects Ford's aviation history, tracing back to the company's early days and the Arsenal of Democracy during WWII. The Eagle Squadron Mustang GT built with Vaughn and the Ford design team is a great way to honour our heroes and keep the spirit of aviation alive for the next generation of American pilots." 2018 marks the 20th year Ford has supported the EAA AirVenture event. All proceeds will be donated to the Young Eagles youth program to encourage and support the next generation of pilots. In all, Ford has donated 11 custom-designed vehicles and helped raise more than $3 million. The one-of-a-kind Eagle Squadron Mustang GT features a 700-horsepower 5.0-litre V8 with a Ford Performance supercharger, RTR carbon fiber wide-body kit and Tactical Performance suspension package. The car's highest bidder also receives an all-inclusive package for two to attend the 2018 Ford Woodward Dream Cruise in Detroit in August to take delivery of the car along with a plaque autographed by Gittin and members of the Ford design team.